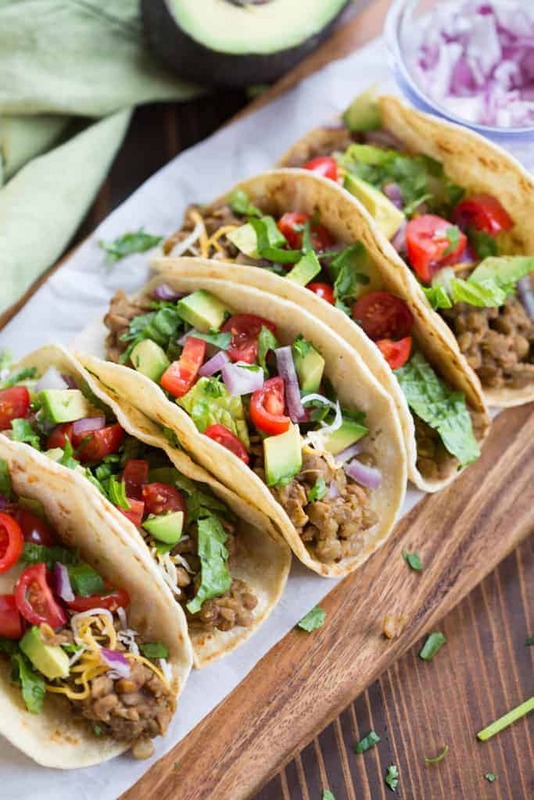 You really wont miss the meat in these flavorful, filling, and healthy Instant Pot Lentil Tacos! Ready in 20 minutes, and easily adaptable to use ingredients and toppings you already have, this vegetarian instant pot recipe is a WINNER. I’m a big fan of mixing up our dinners with some meatless meals. I’m not a vegetarian (far from it 🙂 ) but I also don’t like my family eating heavy servings of meat every single night. One of my favorite vegetarian meals is black bean burgers — so dang easy and TASTY! I love that I usually always have what I need to make them. I also really love this creamy pesto tortellini. I feel like Mexican flavored dishes are even easier to make meatless because of all of the delicious flavor and spices you can add to the dish. These sweet potato and black bean enchiladas, and these black bean and corn quesadillas, for example, always leave us feeling satisfied. 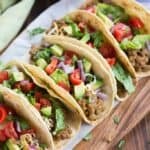 What I really love about these Mexican inspired lentil tacos are how hearty the mixture is–you wont even miss the meat! They are soo flavorful, and delicious, and one of my absolute favorite vegetarian instant pot recipes. The Instant Pot makes this meal even more genius. Throw everything in the pot, and give it a stir. That’s it! Cook it for 15 minutes on high pressure, and you’re ready to eat. No babysitting the lentils, no stirring the pot. You don’t even need to let the pressure naturally release! 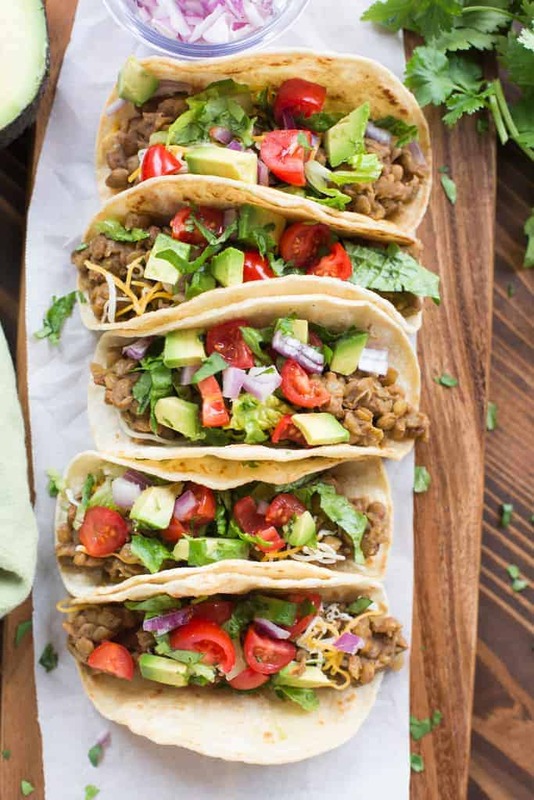 This Instant pot lentil tacos recipe is also really easily adaptable to what you have on hand. Chopped onion for onion powder. Use the saute function on the instant pot to saute 1 cup chopped onion in a little bit of oil, before adding the rest of the ingredients. You can use water if you don’t have chicken broth. I just like the extra boost of flavor that the chicken broth adds. Or you could add 4 teaspoons/4 chicken bullion cubes to the water. Tomato sauce instead of salsa. Try adding corn, diced green chilies (if you like it spicy), or another chopped vegetable, like zucchini. Add all ingredients to instant pot and stir to combine. Close the lid and move valve to sealing position. Cook on manual (high pressure) for 15 minutes. Once the timer beeps, cover the valve with a towel and switch it to quick release to release all of the pressure. Open lid and gently stir. Allow to cool while you prepare toppings. Serve warm, inside corn or flour tortillas, with desired toppings. Try my other Instant Pot Recipes! Recipe adapted from My Plant Based Family. Nutritional label is based off a 1/4 cup servings (to fill 1 taco). Does not include toppings. I just made this and it turned into slop! I’m not sure where I went wrong. The taste was delicious but the texture way off! 2 things that maybe happened? b) I let it slow release the pressure as I was busy running around so it sat on keep warm for 20 min naturally releasing pressure. This was a big hit! 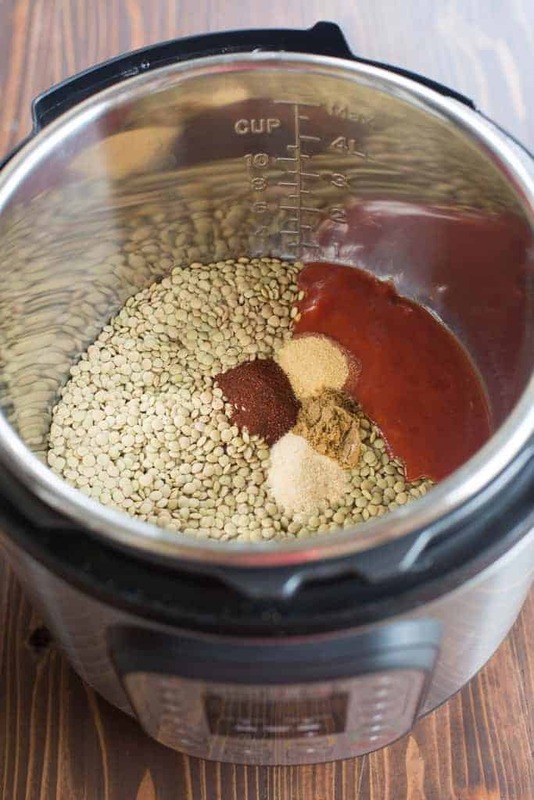 I love how easy dry legumes are in the instant pot! Next time I’ll add just a but more spice as we like it a little spicier but it was really good. This left the lentils done and soft but still with a bit of chew. If you wanted a creamier lentil filling, you could add more liquid and cook a bit longer. But we loved how it turned out. Now I want to okay with it and see what veggies I can add in, like shredded carrots and so on! Can I use red lentils? That is all I have on hand. Thank you. I haven’t tried it with red lentil- I think it should work given that there cook times are very similar. I’d love to hear how it goes! I used half a can of diced tomatoes instead of salsa. They turned out awesome, AND mild enough even the pickiest little dragon liked them. Thank you!! So glad to hear, thanks for sharing! Great recipe, but I cook it in my IP Mini for 4 minutes. Any more and it turns into mush. Somehow all recipes tend to cook much faster in my IP than in any recipes, so just wanted to add this here for any other mini users. Thanks for sharing your tips for cooking in the IP mini! I loved this recipe! Easy, delicious, plant based! I halfed the recipe and it came out wonderfully. Could easily feed four with half the recipe. My partner and I ate half and still have lots for leftovers! This is a keeper recipe. Will share and make again. Thank you! I love this recipe! It is so quick and easy, and the lentils come out perfect. I used veg broth instead of chicken and also threw in a finely chopped jalapeno pepper. I decided to stir in a little corn at the end too. Oh, and try a squeeze of fresh lemon or lime once it is done…really brings out the flavours. This will definitely be added to my weekly rotation. Such a versatile recipe! Thank you!